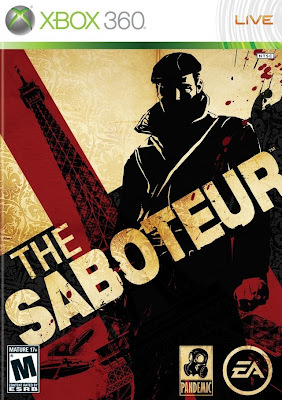 Synopsis: Our good friends at EA gave us of a review copy of the new WWII sandbox title, The Saboteur, for the Xbox 360 and after much distractions of blowing up Nazi stuff; I have got one for you. The main character, Sean Devlin, is an Irish race car driving mechanic for an Italian racing team, who has a vendetta against the Nazis occupying France when a spiral of events occur after a cheating Nazi takes him out of a race. 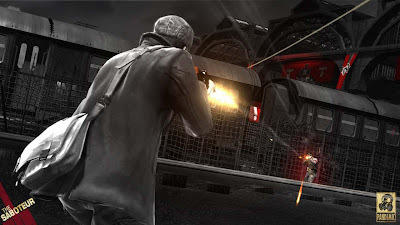 Sean uses the French Resistance, British Intelligence, along with an arsenal of weapons and disguises to sabotage the Third Reich in open world Paris. Throughout the course of the story, gameplay comes in the forms of stealth elements, wall scaling, third person shooting, and racing. Praise: There was a lot to this title that I had a great time with. The location, story, and gameplay work very well and it is unfortunate that this was Pandemic Studio’s final title. Like other sandbox titles, the action and controls are similar to other titles in the genre. The feature that helps this stand out from the rest are the stealth elements and the ability to disguise yourself as a Nazi to infiltrate compounds and blow them to pieces. The ability to climb buildings, whether it is to evade alerted Nazis or to get a vantage point on your next target, is a strong feature that is both fun and extremely useful to complete missions and explore new locations. Vehicles that are “acquired” can been stored in numerous garages for later use, and black market dealers through Paris can replenish your arsenal when you die or run out of ammunition. The “Will to Fight” system is probably the most unique feature I have seen in a title lately. 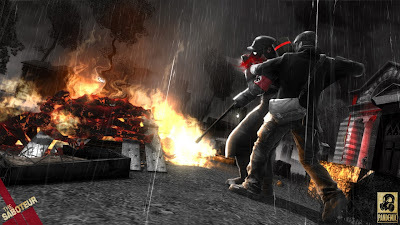 When you start playing through the story, the colors of the city is primarily black and white, these colors are a symbol of hope for the French people, and as you complete missions, color comes back to the city, and in turn the people will also launch an underground resistance and come to your aid when needed. Gripes: Though there was a lot in which I enjoyed, there were also noticeable issues throughout the story and gameplay. 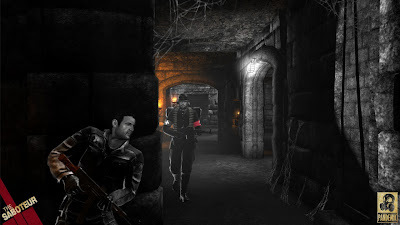 Even though sandbox titles are known for their lack of or miminal load screens, in The Saboteur, the player encounters a loading screen every time they open a door, though the load times are not long, it does get tiresome quickly. The voice acting does not really fit the characters as they sound a little over the top and portray the Irish, French, and German stereotypes through the sometimes painful to listen to accents. I experienced glitches throughout this title sporadically, such as having a vehicles spawn out of nowhere on top of me and the most common incident of having my car get stuck on railroad tracks. Overall, there was a lot of fun to be had playing through The Saboteur. The story does not get old too quickly, however the French accents do, but there is plenty to do to keep one busy with a good sandbox game for a long time. Often times, I would throw in the game to play through the story, but found myself just blowing up Nazi vehicles, towers, and refueling stations in creative and satisfying ways. The soundtrack, cars, and weapons all fit the WWII era very well and the “Will to Fight” system looks great and plays a large roll on the mood of the game throughout the areas of Paris. Last but not least, there are cabarets. Mashbuttons.com gives The Saboteur a 8 out of 10. 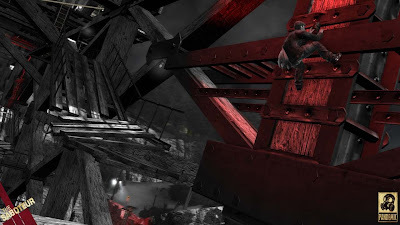 The Saboteur is available now for the Xbox 360, PC, and the Playstation 3.